Some people will be dressing up their pets for Halloween this year. Dogs tend to get dressed up more than cats. The results of the National Retail Federations (NRF) 2015 Halloween Consumer Top Costumes Survey conducted by Prosper Insights & Analytics are in and pumpkin costumes have topped the list. This was followed by hot dog costumes, Batman, devil costumes and bumble bee costumes. 12.9% of people plan to dress their pets up for Halloween according to the survey. Pumpkin and hot dog costumes also topped last year list of top pet costumes. 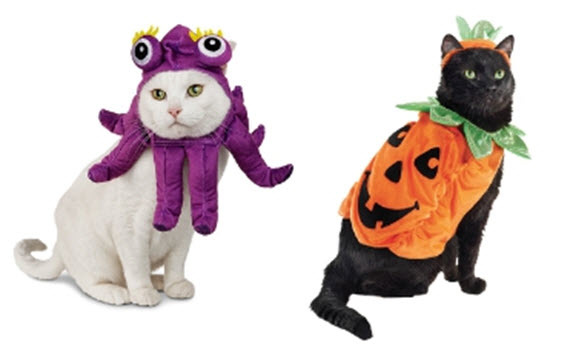 Octopus and pumpkin costumes for cats from Petco are pictured above. The octopus costume is adorable but we doubt your cat will want to wear it for very long. Mannie the Frenchie is wearing PetSmart's Paw Pet Halloween Dinosaur Costume in the photograph below. Of those surveyed in early September nearly 80% had already decided what costume their pet would be wearing. Here is the ranking of those who had already chosen their pets costume. Minion costumes are new on the list this year.